This artist’s view shows the planet orbiting the young star Beta Pictoris. This exoplanet is the first to have its rotation rate measured. Its eight-hour day corresponds to an equatorial rotation speed of 100,000 kilometers/hour — much faster than any planet in the Solar System. Astronomers have measured the rotation rate of an alien planet for the first time ever, finding that a huge Jupiter-like world called Beta Pictoris b has a day lasting just eight hours. The equator of Beta Pictoris b, a gas giant about 10 times more massive than Jupiter, is moving at about 62,000 mph (100,000 km/h), researchers said — far faster than that of any planet in our solar system. In fact, Beta Pictoris b is the fastest-spinning planet yet seen. On Beta Pictoris b, a planet still forming nearly 64 light-years away, a day lasts only 8.1 hours. See how Beta Pictoris b spins so fast in this Space.com infographic. "It is not known why some planets spin fast and others more slowly, but this first measurement of an exoplanet’s rotation shows that the trend seen in the solar system, where the more massive planets spin faster, also holds true for exoplanets," study co-author Remco de Kok, of Leiden Observatory and the Netherlands Institute for Space Research, said in a statement. "This must be some universal consequence of the way planets form." The researchers used the European Southern Observatory's Very Large Telescope (VLT) in Chile to study Beta Pictoris b, which lies 63 light-years from Earth in the constellation Pictor (The Painter's Easel). You can zoom in on Beta Pictoris b's parent star in this video. The VLT spotted the molecular fingerprint of carbon monoxide in the giant planet's atmosphere. Further, this carbon monoxide signal was shifted and broadened considerably as a result of Beta Pictoris b's rotation, much as the sound waves emitted by a police car's siren shift as the vehicle approaches and passes a stationary observer. This graphic shows the rotation speeds of several of the planets in the Solar System along with the recently measured spin rate of the planet Beta Pictoris b. The new study could help astronomers get a better handle on how planets take shape and evolve. "What this tells us about planet formation is not clear to me, but the accretion of angular momentum is definitely an important factor during formation," study lead author Ignas Snellen of Leiden Observatory told Space.com via email. "Planet formation models will have to be able to reproduce this behavior." 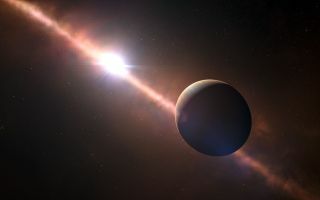 Snellen and his team needed just one hour of VLT observing time to pin down Beta Pictoris b's rotation rate, suggesting that the planet won't be in a class by itself for long. "I think that maybe the most exciting aspect of this paper is the relative ease with which we performed these observations," Snellen said. "It means that in the coming years we will be able to measure the spin velocity of a whole sample of young gas giant planets." The technique should also allow astronomers to make detailed global maps of exoplanets using giant future instruments such as the European Extremely Large Telescope, which is slated to come online in the early 2020s, researchers said.